Old Sweet Memories, and Sad Too. Recently, I came to view an old photograph posted in the ‘Face book’ page by one of my friends Balaji (Parameshwaran Balakrishnan). The post was in connection with the World Dramatics Day Celebrations. Naturally, the forty years old photograph aroused an enthusiasm to recollect the memories of those Golden Days of Dramatic activities. There is no exaggeration that I am seeing the photograph, the first time through the FB page. Thanks for Balaji, my friend. 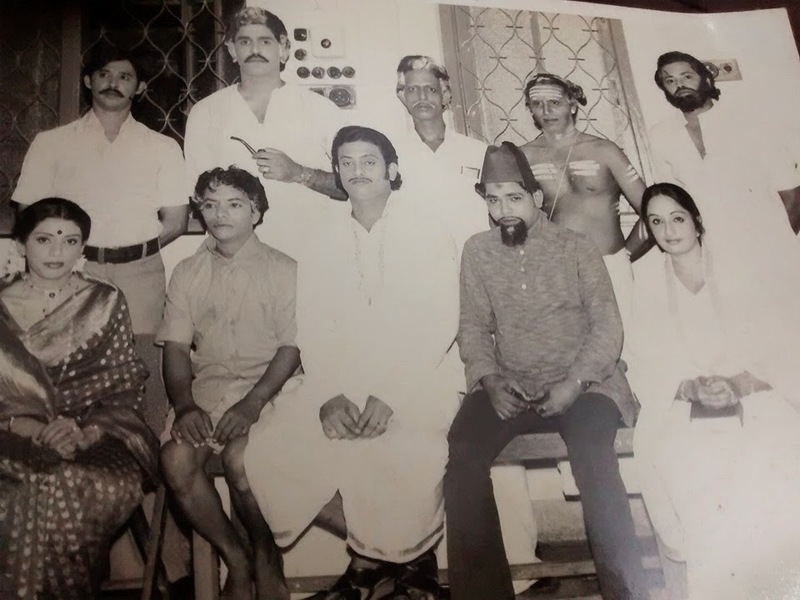 It is the group photo of the actors enacted in a Malayalam drama ‘Kaahalam’, presented by the Bombay Keraleeya Samaj, Matunga- Mumbai as its major Onam celebrations of certain year before 1980. Sorry to say that I am not remembering the exact year. The important factor related to me and the drama is that I was the lyrics provider of that drama presentation. I provided two lyrics (Songs) in this drama and thus rendered my participation as a lyrics writer. The songs were provided hilarious music and sung by Shri: K.J. Kuruvila(late), my beloved friend. The drama was written by Shri: T.L. Jose (late). I first time met with Shri: T.L. Jose at the rehearsal camp of this drama. He was a rising ‘Play- writer’ at that time through his famous drama “Samudhayam” (Community). I remember that I was so pleased to see him and talk with him. After the presentation of the drama ‘Kaahalam’ at the famous Shanmukhanandha Hall at Mumbai, Jose made the drama into its print form. I thankfully remember that he included the names of all the participants of the drama in the front page of the book. The book was named as “Samagamam”, means The Re-Union. The drama was directed by Shri: Babu Vizhinjam (late) and enacted in the lead role also. He made every effort to bring the drama to its heights. After years went on, many of my beloved friends stepped into the Malayalam Silverv Screen. Captain Raju Daniel, Smt. Valsala Menon, Balaji, Raju.M.Devdas (KochuRaju), PremKumar (Music Director of Loka Samastha); all were made their presence in the Malayalam films as well as TV seriels. It is so glad to see them on the screen as a spectator. Many of these beloved friends younger than me were not there in the life anymore. The memory of them precipitate heavy sadness in my heart. T.L. Jose, Babu Vizhinjam, K.J. Kuruvila (my music director and singer), Vasu Kakkanad: I pay my respects to their fond memory. Standing from left to right: 1. Name not known, 2. Captain Raju , 3. Bhaskaran Vellamparambil, 4. Viswanathan Palloor, 5. Babu Vizhinjam (Late). Sitting from left to right: 1. Valsala Balakrishnan, 2. Raju. M. Devdas (KochuRaju), 3. Balaji, 4. Vasu Kakkanad, 5. Mrs. Valsala Menon. good recognize by means of the statement section offered below immediately tutuapp ios After complete the installation, a symbol will certainly appear on your food selection bar. nice. ES File Explorer File Manager is a powerful tool to manage Programs and files on your Android/ iPhone devices and also PC, click here to download directly. Aptoide for PC is the tool through which you can use almost all the Android apps on your PC for free. Thanks for the great Post. Loved the comments. SBI Clerk Recruitment 2018 for 8301 Junior Associates Posts. Check out more info on eligibility, application, dates for State Bank of India (SBI) SBI Junior Associate Recruitment 2018.